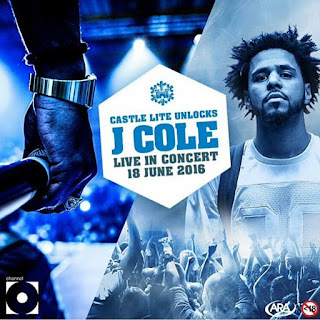 Johannesburg, South Africa - Get ready South Africa, Castle Lite, in association with Channel O, has exclusively UNLOCKED hip hop sensation, J Cole, on 18 June at the Ticketpro Dome, and you have to be part of the extraordinary, experience. Why? Because it’s going to be an extra cold world as J Cole unleashes his chart topping tracks, inspirational lyrics and unforgettable beats…for one night ONLY. Yesterday was definitely one for the history books in as far as the way Castle Lite revealed that they would be bringing out international hip hop sensation, J Cole, pixel by pixel on a massive digital billboard in Sandton, Johannesburg. This integrated, innovative campaign was a world–first, as Castle Lite utilised social media and outdoor media to form the face of the artist. By incorporating Twitter into the LED billboard, social media was used to drive the hype surrounding the reveal by inviting the public to help unlock the face of the artist. This was done every time they used the hashtag #CastleLiteUnlocks. It started with a screen only showing live Tweets and as the campaign progressed, the volume of incoming tweets helped reveal the image, pixel by pixel, throughout the day. Initially the image appeared blurred, however, as the day progressed, the reveal of J Cole’s image increased in speed as the Tweet frequency increased. Based on the 380,000 pixels available, the number and frequency of tweets was used to calculate the number of pixels that needed to be shown every loop, and then de-pixelate a random area of the image. The more people tweeted, the more pixels formed to finally reveal 100% of J Cole’s face around 16h00. Having released 3 international number one charting records, J Cole is the self-proclaimed king of modern day hip hop. He’s a lyrical genius and prolific rapper, using his words to highlight self-reflection and contemporary social discussions, the true essence of hip hop. The stature of his artistry has been recently recognised as he received an endorsement from President Obama two weeks ago after performing at a US Democratic Party Fundraiser. Music, both local and international, forms an essential part of Castle Lite’s DNA but most importantly, it plays an integral role in the lives of South Africans. “We are extremely excited to be bringing a performer of J Cole’s standing to the country this coming June. J Cole is a progressive artist, and we feel that unlocking him in South Africa will create an unforgettable music experience for Castle Lite fans” says Marketing Manager of Castle Lite, Vaughan Croeser. General access and Golden Circle tickets will available for purchase at R250 and R490 respectively, from 31 March at www.castlelite.co.za. There is an age restriction of 18 years and older.